Braddock Tiles in the former Jones Street Church. Photo by Tod Seelie. 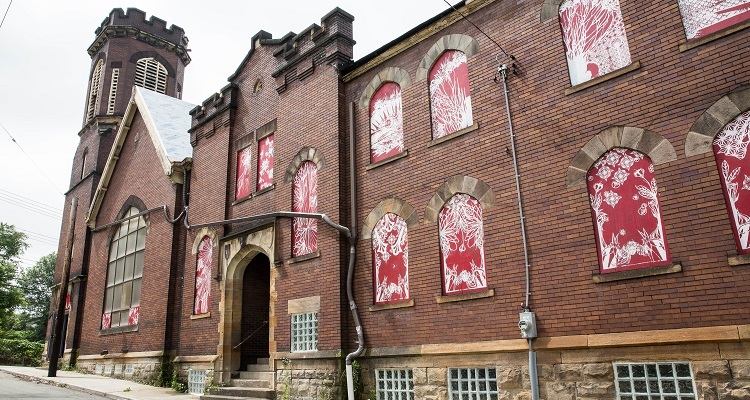 Eight years ago, professional artist Caledonia Curry came up with an idea while visiting the abandoned Jones Street Church in North Braddock. The experience inspired Curry to transform the church’s basement into Braddock Tiles, a ceramic studio and creative workshop focused on serving the blighted neighborhood. After years in development, the project debuted last winter with a successful Kickstarter that raised $102,410, twice its campaign goal. The contributions went a long way towards setting up the space but Braddock Tiles still needs more help to get up and running. On Friday, April 22, Swoon and the Heliotrope Foundation, a nonprofit dedicated to rehabilitating communities in crisis, will continue fundraising efforts with a benefit show at The Rum Room in Lawrenceville. The event will include an arts exhibition and sale showcasing prints from over 70 artists, as well as ceramics from Braddock Tiles. Curry believes the occasion will also expand the project’s reach to neighborhoods outside of Braddock. “Each event is a way to raise funds and also getting people involved, getting people excited, and letting people know that even if it’s not in their neighborhood, it’s a project that’s working for the benefit of the larger community,” says Curry. 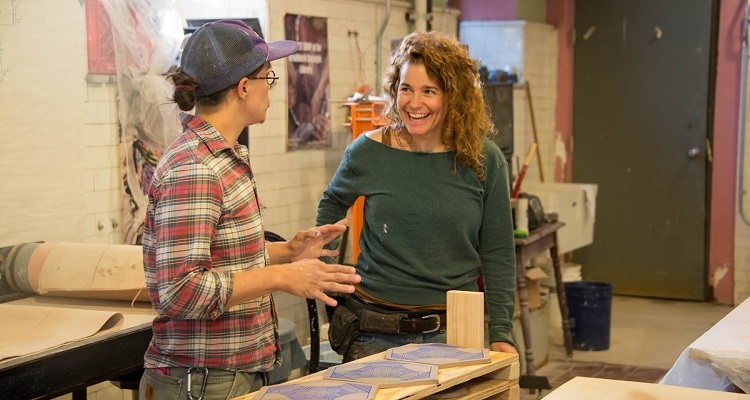 Swoon (right) and ceramicist KT Tirney making tiles. Photo by Kat Kendon. Once Braddock Tiles is fully functional, artists and volunteers will use the facility to produce 20,000 professional-grade, handmade tiles to fix the church’s roof. From there, the space will house a working tile factory that will provide employment and job training to young Braddock residents. Curry explains that, while the project’s job training element is still in the beginning stages, they now offer three-month paid internships to kids aging out of the Braddock Youth Program. “Our long-term goal is to expand the internships, and work with the Braddock Youth Program to identify people who are ready for it and can benefit from them,” says Curry. The Braddock Tiles Benefit Show will take place from 6 to 9:30 p.m. 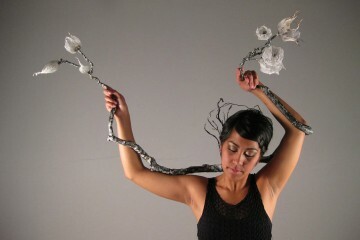 The art will be on display at The Rum Room through­ Saturday, May 28.